As its name suggests, allspice’s flavor is reminiscent of a combination of spices, including cloves, cinnamon, nutmeg, and pepper. The allspice tree, a member of the mytrle family, is indigenous to the West Indies and Central and South America. 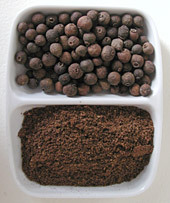 Jamaica produces most of the world’s allspice supply, and not surprisingly, allspice figures strongly into Jamaican cuisine. The complex, exotic flavor of Jamaican jerk can be attributed primarily to allspice. The liquors Benedictine and Chartreuse also include allspice, as do many holiday sweets, and Scandinavian herring dishes. This entry was posted on Saturday, September 22nd, 2007 at 3:30 pm	and is filed under Encylopedia, Herbs & Spices. You can follow any responses to this entry through the RSS 2.0 feed. You can leave a response, or trackback from your own site.